If you need to meet your 457 visa work requirements, then you will need to get some insurance. This is quite a foreign concept for many, who have never had to get private health cover before. However, it needn’t be a chore, the only trick is to find the right one for you and your family. Perhaps that is family Frank 457 health insurance? It makes sense to do the research now, as though you may well be searching for cover that aids you visa application, health insurance is an important thing in Australia, and goes well beyond your 457 visa work requirements. So it is worth making a good investment from the beginning. Though whether family Frank 457 health insurance is about more than just your 457 visa work requirements, at the same time it is important to know that it does work for this end. Which is why we are happy to report that family Frank 457 health insurance does indeed give you the proper cover to meet your 457 visa work requirements. In fact, as the policy is especially designed to this end, they also have made it a priority to make sure that you get your letter of compliance as quickly as possible. It is very important that whichever company you choose, that you do meet the proper standard for your visa. If you would like more information about your 457 visa work requirements, you can see this at Immigration Australia here. The next question that we would ask is if whether family Frank 457 health insurance is good value for money. After all, health insurance is a financial commitment as well as an investment into health. 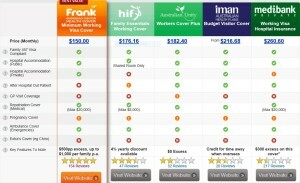 As you can see from that chart below, we have Frank Family 457 health insurance rated as the best value policy! This is, however, only for the basic package – which is all that Frank offers. There are no options with family Frank 457 health insurance to have a load of extras, etc. This then means that if you want to get extras, you will need to get a whole new policy to achieve this. There is every chance that this means less value for you. But then, if you do want to save some cash and get the cheapest policy you can, you have certainly found it here. Another thing that is vital to check in terms of value, is whether the policy has excess attached to it. This can drastically change the value of the cover, meaning that you will have to payout more down the track, should you actually use your insurance. As you can see from the chart below, family Frank 457 health insurance does have excess attached. This takes away from the value of the policy somewhat, as though family Frank 457 health insurance has the lowest upfront costs, you will have to pay to use this cover. Of course, for some this may not be an issue and saving money on upfront costs should be the priority. For others, however, this changes things. Family Frank 457 health insurance does have some perks though. This include full cover for both private and public hospitals. This is at any hospital, rather than just agreed hospitals, as some health insurance companies stipulate. So you do not have to worry with fine print on this one, as you are covered across the board – which is a good thing! Another plus is that their policies are very clear. Like having cover across all hospitals, everything makes sense with family Frank 457 health insurance, so you do not have to worry about complications. Unfortunately, as mentioned above, family Frank 457 health insurance is only offered as a basic cover. This means that if you want extras, you have to take on a whole other policy – which is not ideal. For many that are looking for family cover to meet their 457 visa work requirements, they will want to make sure that things like dentists, etc, are on their health cover. This is something that this policy will not help you with. However, there are those that are simply looking for the cheapest cover that helps with their visa – and that is fine. If though you are doing this as you plan to save money and just use Medicare, this could be a mistake! Some people from certain countries are able to access Medicare when they enter Australia, due to reciprocal healthcare agreements between nations. This then leads many to seek the cheapest health care cover, and then get rid of it once they are in Australia. However, people need to be aware of the Medicare surcharge, which is an added tax in Australia against those who do not have private health insurance. This then means you could end up paying the same or more for less healthcare. Is family Frank 457 health insurance for you? Whether family Frank 457 health insurance is for you greatly depends on what you want. If you are seeking a policy that meets your 457 visa work requirements that is cheap and gives reasonable value, then it could well be. However, if you are seeking a policy that includes a ton of extras and think you may be making use of your policy down the track and do not want to pay excess, then most likely not. So the question really is, which are you?